Mountains and feathers, oh my! Mountains and feathers, oh my! Mountains and feathers, oh my! No, I’m not mad, just channeling my inner Judy Garland and skipping down the yellow brick road. 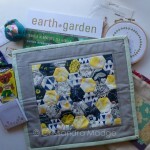 Or possibly, I’m looking at these photos that I took of my Schnitzel and Boo mini quilt before I sent it off on it’s great journey to the United States, to live with Cassie! It appears they matched us up in alphabetical order for round 3 of the swap. 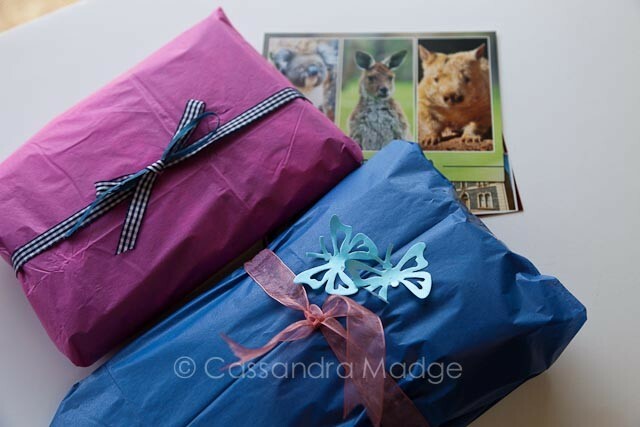 Here are the wrapped parcels that I sent off….. including a couple of postcards for local colour. 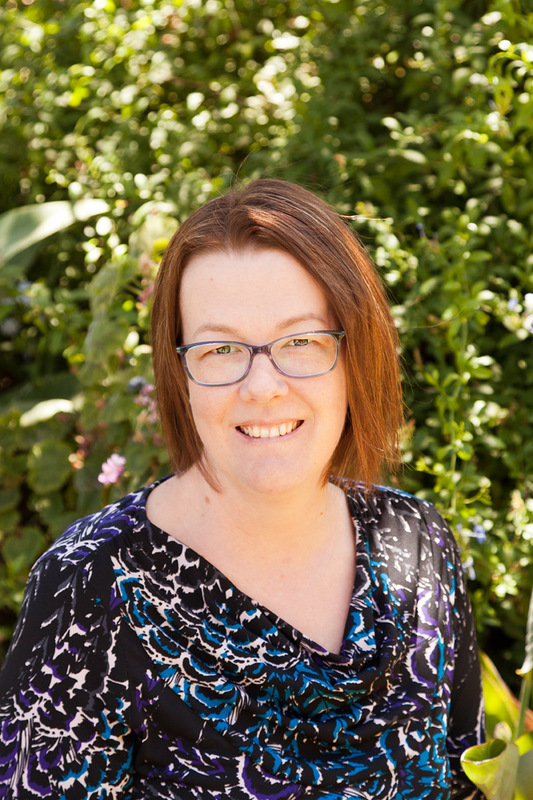 I do find it fascinating thinking about all the other lives that intersect with mine. It is wonderful when you get some context, see what it looks like where they live or work or go to school. 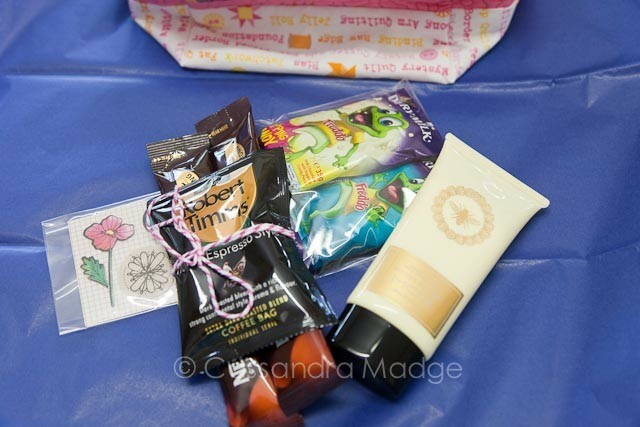 Inside the zipper pouch was some treats, some coffee, stickers and some gorgeous hand cream. 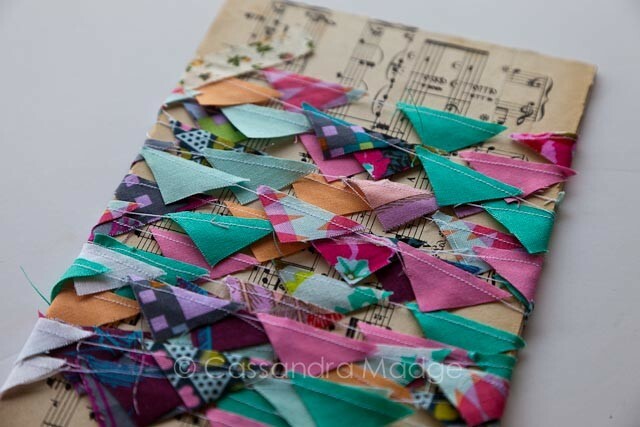 I also included the mini bunting I made with all the triangle offcuts from the piecing….. they were just too pretty to throw away, and too tiny to use anywhere else. Wrapped up on a piece of mat board, decorated with antique music sheets. Finally, we come to the main event! 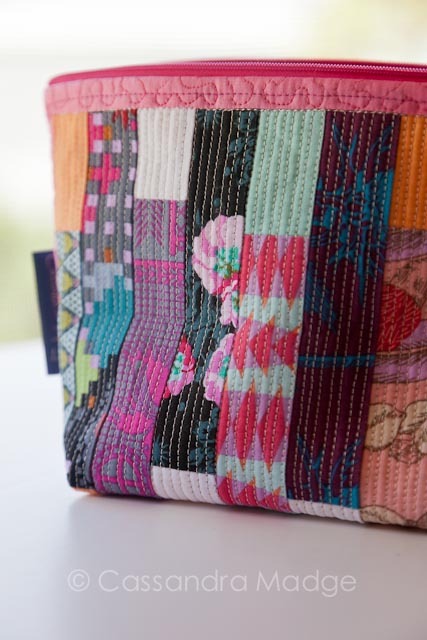 How perfect is this ribbon, included in my order of Anna Maria Horner “Pretty Potent” fabrics for this mini from Clair’s Fabrics? 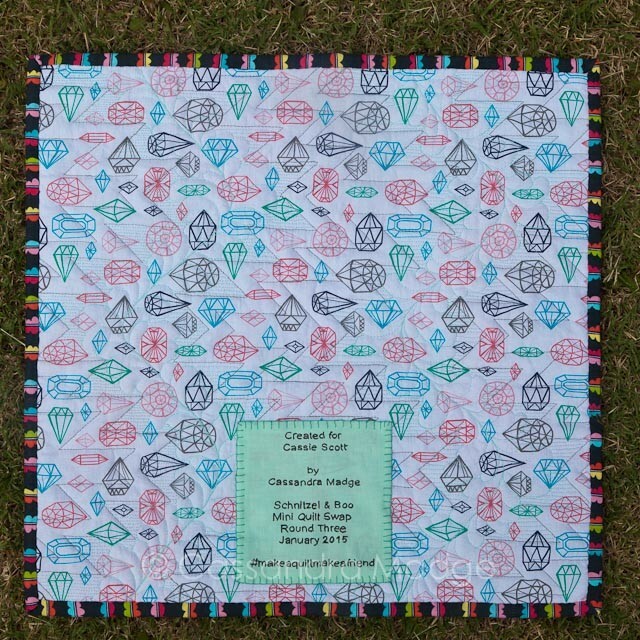 Backing was a fat quarter of faceted gems from Spotlight, just the perfect match colour and feel wise for the modern geometric piecing on the front. The binding was also a lucky find at Spotlight, the stripes are another fabulous colour match and just provide that finishing touch. I hand wrote the label, tracing it over a print out on my light pad. The easiest way to make sure I don’t misspell or otherwise mess it up. After invisibly slip stitching it on, I decided to blanket stitch around the outside as well, just to give it some added fun. 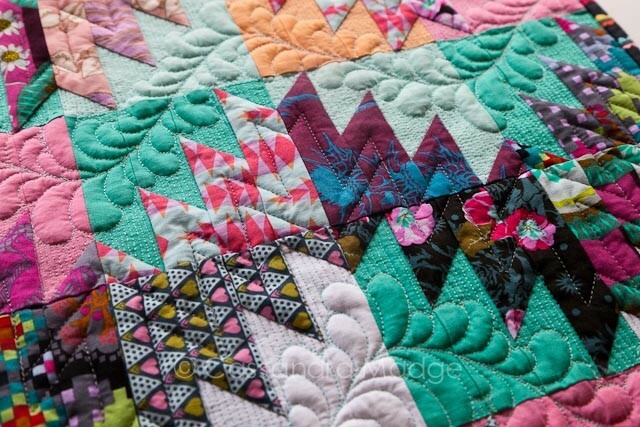 By far and away, my favourite part of this mini though, was the quilting. 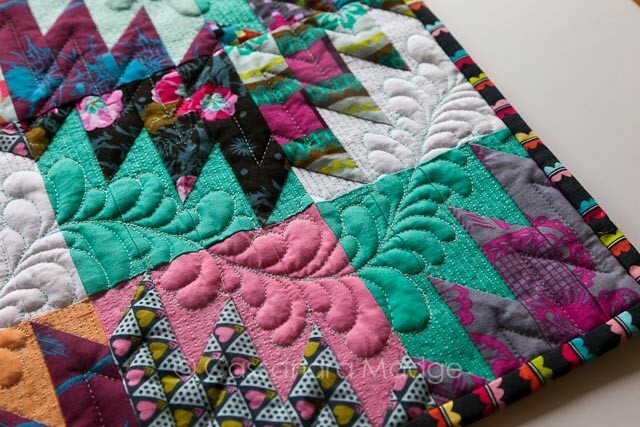 Oh, the quilting! After carefully ditch stitching around all the points to avoid distorting the piecing, I traced a feather spine up the middle of the solid fabrics. 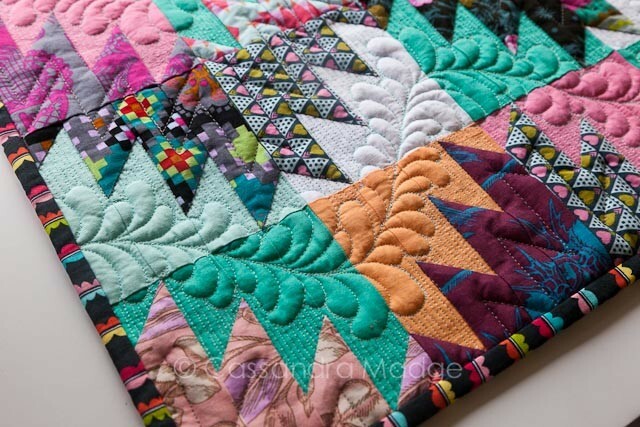 One side of the quilt goes from left to right, the other side, right to left. I tried to keep some space around the feathers, but still bent and fit them into each of the pointed shapes. 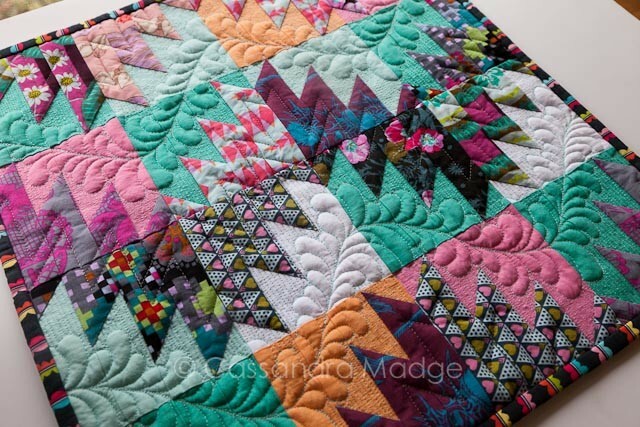 After the feathers were completed, I went back in with my free motion foot and added a dense back and forth matchstick quilting to allow those feathers to really pop out of the quilt. Inside the patterned section, I simply traced a line 1/2 an inch inside the seam, which often met up from one side to the next, as each piece was only 1 inch wide finished. It created a dynamic arrow effect in the points, which was exactly the feel I was looking for. I know this is heading off into winter, so I tried to pack some summer sunshine in with it. I do so hope my partner loves is as much as I do. 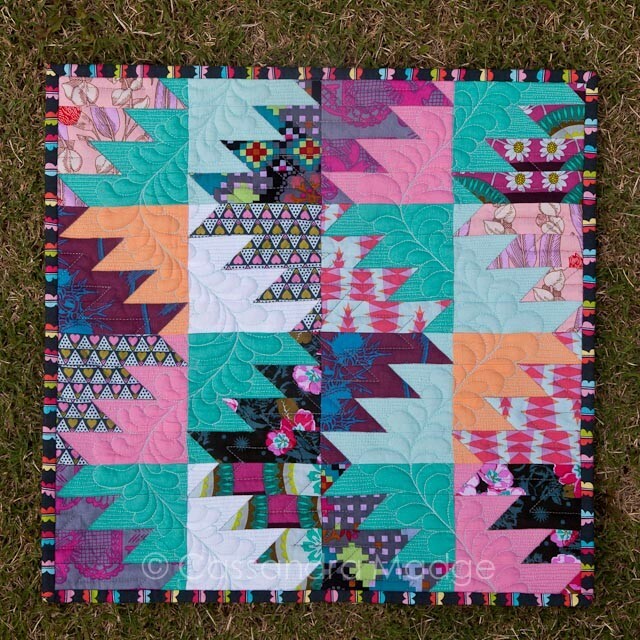 It will always be, in my mind, my breakthrough quilt. My first project in our new house, my first time trying something completely from scratch with just a client brief. The quilting was a complete moment of mediation, and the finished product I think, shows that. 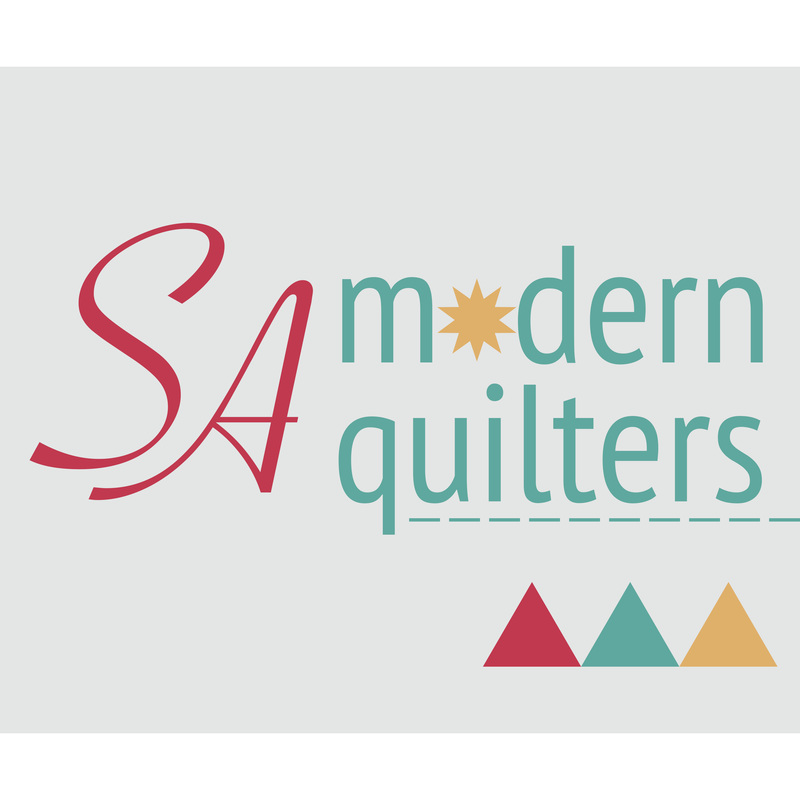 I am really excited to see what this leads me to, and how my quilting will grow from here. Have you had an aha moment like that? That mini is gorgeous! 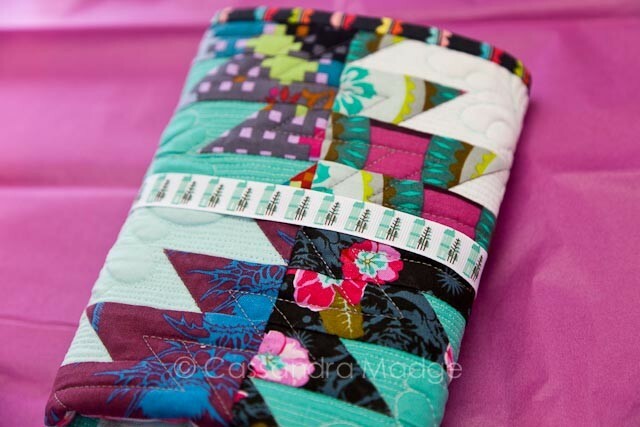 I love the matchstick quilting on the pouch and the feathers on the mini. Just divine! Oh my Goodness! Cass! The feathers … LOVE! so clever and gorgeous! Gorgeous! 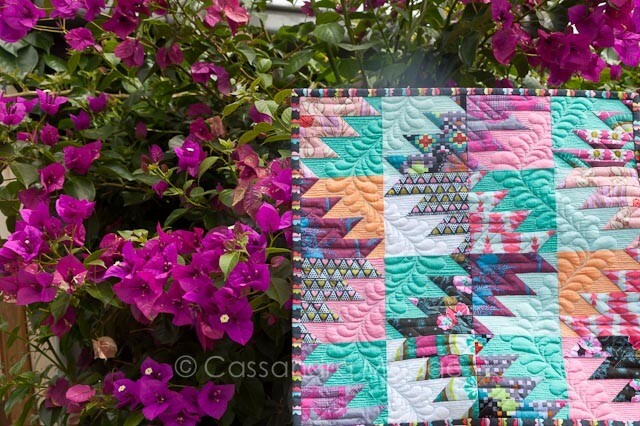 Thanks for telling us what you did and how with the quilting. 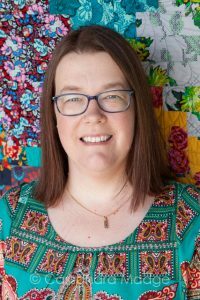 I’m trying to develop my machine quilting skills so all the tips help. Thank you for explaining how you quilted the mini & for providing good photos which i was able to enlarge on the computer to study the effect. Just amazing work!!! 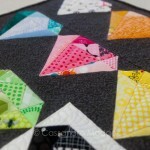 I tried to make sure that the angles I shot showed up the different depths and lines of quilting. Glad that you found them useful! 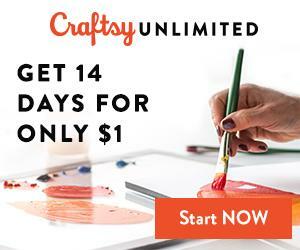 awesome packages, the mini is to die for and the quilting – just amazing ! 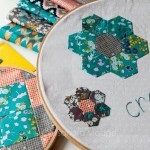 I love the FMQ effect it’s very textured, I must have a go. What batting did you use? As it was a wall quilt and weight/feel wasn’t an issue, I used Poly batting to give it that extra puff. 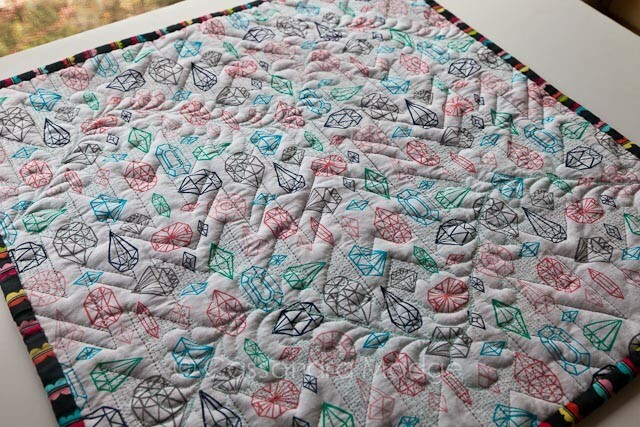 I normally use a low loft bamboo batting, but I really did enjoy the effect that the poly gave to the quilting. I’m so glad you enjoyed the texture! Love the loft in your Mountain & Feather Mini. Most excellent FMQing.